A quick view of the most influential metrics in Sylva NC. 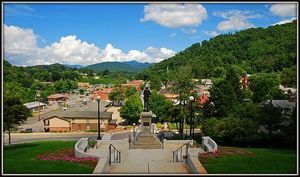 Located in Jackson County, the charming small town of Sylva NC, with a population of approximately 2,600, offers many restaurants and shops along its downtown streets. Voted the county seat in 1913, Sylva gained a railroad station and became a center for business in the area. With it's majestic courthouse perched atop a hill at the end of Main Street in downtown, the town as all the makings of a picturesque Southern town. While the building no longer serves as the official courthouse but rather as the Jackson County Public Library, it still commands attention as it overlooks all of downtown. Currently undergoing a revitalization, Sylva's downtown has become a hotspot for local breweries and antique markets. It now hosts several festivals and music concerts throughout the year including "Greening Up the Mountains" in the Spring and "Concerts on the Creek" during the summer months. The town has four parks - Poteet Park, Bridge Park, Mark Watson Park and Bryson Park - offering along them playgrounds, picnic shelters, volleyball and basketball courts, baseball fields, tennis courts, an outdoor concert stage and more. There is also a community pool located nearby at Roscoe Poteet Pool. With its proximity to Asheville NC for those seeking an urban experience, as well as to activities such as hiking, whitewater rafting, fishing and more for the outdoor enthusiast, Sylva NC is sure to please everyone. View our selection of available properties in the Sylva NC area. Check out the latest demographic information available for Sylva NC. Learn more about schools near Sylva NC complete with ratings and contact information. Browse through the top rated businesses in the most popular categories Sylva NC has to offer.